Happy Halloween! Here in the back of beyond we have an annual pumpkin carving competition on Halloween. So instead of trick or treating the children and some adults carve a pumpkin and leave it lit outside their houses and each year a different secret judge goes around judging the pumpkins and awards prizes. It is lovely to walk round the village after dark seeing all the wonderful pumpkins. For the last two years my husband has won the prize in the "I'm not telling you my age" category and felt under pressure to live up to his previous form. This year he created two amazing pumpkins but was pipped at the post by our next door neighbour with an impressive haunted house scene carved into a pumpkin. 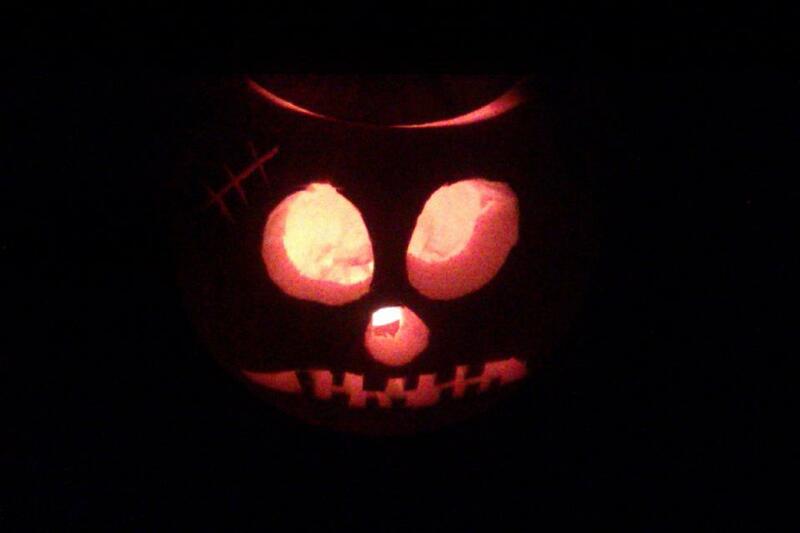 We did still manage to have a winning pumpkin in the household as my son came joint first with his 'brainless bully' pumpkin. My creativity is kept firmly in the kitchen. I created a batch of Halloween biscuits for all the children visiting the pumpkins. 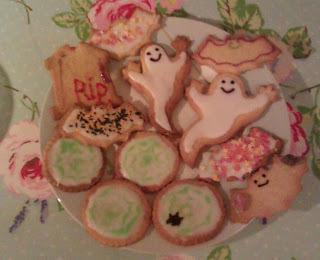 My son enjoyed decorating the biscuits and eating them with all his friends. Mix the butter and sugar in a large bowl with a wooden spoon, then add the egg yolk and vanilla and briefly beat to combine. Sift over the flour and stir until the mixture is well combined - you might need to get your hands in at the end to give everything a really good mix and press the dough together. Roll out your dough on a floured board and cut into shapes of your choice. Place on a greased baking tray and bake for 8-10 minutes until biscuits are light golden in colour. Decorate however you fancy!